Principal novidade e o suporte a captura física de iDevices nas suas mais recentes versões: iOS v4.3.5 para iPhone, iPhone 3G, iPhone 3GS, iPhone 4 e iPad 1, e iOS v4.2.10 para iPhone 4 CDMA. Cellebrite is pleased to announce the release of UFED Physical Analyzer v2.1.1, supporting iPhone and iPad Physical Extraction on the latest Apple iOS versions released to market. UFED Physical Analyzer users are required to update their software in order to ensure compatibility with the latest Apple iOS versions. 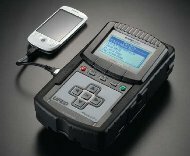 This mandatory update provides a solution to all known issues related to the operation of UFED Physical Analyzer in conjunction with the latest Apple iOS versions. Maiores informações ou para atualizar seu produto, entre em contato com o fornecedor da Cellebrite no Brasil. Qual é o valor desse equipamento no Brasil. Qual é o fornecedor no Brasil? Não sei sobre valores... A TechBiz é distribuidora da Cellebrite no Brasil.